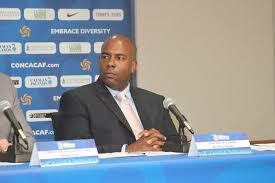 July 4 – Bruce Blake, First Vice President of the Cayman Islands Football Association (CIFA) and a Caribbean Football Union (CFU) executive committee member, has denied at any time receiving any ‘secret’ commission or engaging in any money laundering activity. Blake, who was arrested June 29 by investigators from the Cayman Islands Anti-Corruption Commission, was released on Bail without being charged. In a statement via his lawyers he has given more detail of the allegations. Blake’s arrest was on suspicion of receiving secret commissions and money laundering in relation to his signing of two loan agreements on behalf of CIFA relating to two $600,000 amounts. The money was received in CIFA’s Butterfield Bank account and then transferred to the CIFA loan account at Fidelity Bank. This is the bank where disgraced CONCACAF president Jeffrey Webb was an employee. Webb is currently awaiting sentencing in the US having pleaded guilty to corruption charges in the US Department of Justice investigation into wire fraud and money laundering by football executives from throughout the CONCACAF and CONMEBOL confederations. What is not declared in the statement is where the money came from or who “represented” to Blake that the money was to pay down the Fidelity Bank loan. There have been two arrests of CIFA officials but the identity of the second official is unknown. Blake says he has been co-operating with the investigators including supplying them with his computer, telephone, books and records. “Mr Blake has not at anytime engaged in any secret payment(s) or improper business or unprofessional practices or advantages for himself or any other person(s) or entity. Mr. Blake is innocent of these suspicious allegations against him and the Law protects the Presumption of his innocence. Therefore, Mr. Blake has nothing to hide and no information to withhold from the Anti-Corruption Commission investigators,” said the statement. Blake was a lawyer at international law firm Maples and Calder, before he resigned last year after 17 years at the firm to take over as interim president of CIFA. When Blake left, Maples confirmed it would be continuing its $100,000 annual sponsorship of local football via a grassroots programme. The money was crucial for CIFA as the government had pulled its $130,000 grant to the federation – their concern was over governance issues within the federation’s elections. CIFA’s accounts were later referred to the anti-corruption commission. But it seems there was already a wider investigation taking place. “Mr. Blake is obviously shocked and dismayed by these suspicious allegations, bearing in mind that Mr. Blake fully cooperated with the US authorities, CONCACAF and FIFA in their investigations of these matters,” said Blake’s statement.